This blog post is dedicated to that four-letter word that will make any finance blogger blush, twitch, foam at the mouth even: Debt. We have it. We have lots of it. To be precise, Mr. P and I have six figures worth of debt, and the first digit wasn’t even a 1 until this past month. The scariest part of all of this debt is that I didn’t even realize it was debt until about a month ago. For the past three years, we have been homeowners, and it took me over two years to realize that my mortgage was, in fact, debt. On a subconscious level, I knew it was debt in the sense that I knew I was obligated to fork over a monthly payment. I also knew it was a significant amount of debt when I joked at the closing that we were now the proud owner of a window and a doorknob since we had (only) purchased 20% of a home. But it was not until a month ago that I actually uttered the phrase, “We are buried in six-figures worth of debt.” Prior to that, I had always just called it a mortgage. Graduate college, get a well-paying job, purchase a home, put up a white picket fence, get a dog, pop out 2.5 babies or whatever the average is now, and live happily ever after. This conveyor-belt story arc that society touts as the American Dream is really compelling. In the past, most Americans have subscribed to some, if not every, part of this lifestyle. And they seemed OK, so why wouldn’t we be? It might not be the right course of action, but it’s a well trodden path. And let’s be serious. When you find yourself lost in the woods, you don’t traipse through the underbrush; you pick the path. It looks safe. By all accounts, it seems to be the right move. Move along I did. I hopped on that conveyor belt so fast, I’m not even sure it was a conscious decision. After undergrad, I landed a teaching position, enrolled in a graduate program, and socked away between 50-75% of each paycheck while I lived at home. * When we got engaged, we started house hunting before we started wedding planning. It was that much of a given that we would buy a home. Society said so, and we agreed. Lots of people will tell you the first part of making smart financial decisions is to become more financially literate. The problem is that financial literacy actually didn’t help much in terms of this decision. Sure, I knew what it meant to be “house poor”. I understood that I wanted my mortgage payment and my taxes to comprise less than 20% of my income. But I didn’t really understand that signing up for a mortgage was signing up for debt. In my mind, the two entities stayed separate. Finance gurus are quick to harpoon consumer debt as bad at its best, downright foolish at its worst. Student loans might be a necessary evil. But mortgages? Mortgages are a given, a staple, a point of pride in a lot of financial literature**. Since the creation of my fledgling blog, the personal finance blogosphere has been abuzz with people speaking out against homeownership due to housing markets and lifestyle choices. Housing is too expensive. Home ownership is too permanent. But I’m not sure we frown on mortgages the same we frown on, let’s say, shoe purchases. An affordable mortgage–whatever that actually means–that does not leave you house poor is not usually categorized as excessive consumerism. Despite the fact that much of the literature on finances colors debt differently depending on the type, this might be one instance where I wish we’d all paint with broad strokes. While I may not have considered my mortgage a debt in the same way that I would consider an unpaid credit card bill or a student loan, I made the deliberate choice to purchase a home. As the 1,294,734,561 signatures on the closing paperwork verify, I was entirely present, numb hand be damned. I set out to buy a home and buy a home I did. I am not writing this post to elicit sympathy or to place blame; my debt was my decision. Instead, like so many other people before me who have shared their debt stories, I thought I’d add mine to the pile. This is not the story of someone who bought more things than she could afford. This is not the story of someone who graduated college with a diploma and an obligation to Sallie Mae. This is the story of someone who eagerly bought into the narrative of the American Dream that society sells. This is the story of someone who successfully completed Steps 1-4 on Dave Ramsey’s Home Buying Tips webpage. 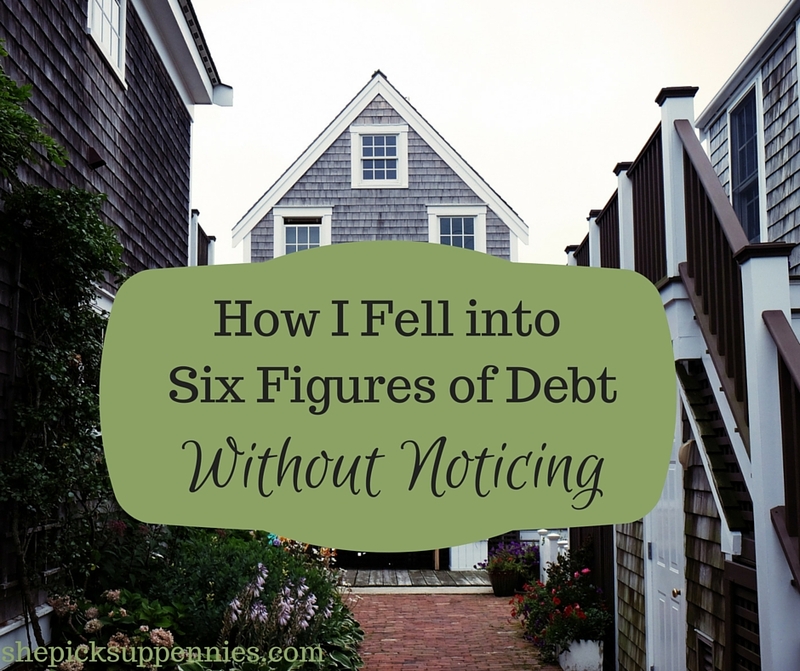 This is the story of someone who is steadily and methodically climbing out from six figures of debt…now that I realize I have it. **And by this, I mean books one would read in a library. Not blogs. So Tell Me…Do you have a mortgage? Do you feel icky just thinking about it? Are you going to be like my mother, my brother (if I had one! ), my uncle, and everyone else who tells me to “think of the tax benefits”? I don’t think of it as irresponsible, and I’m not sure all other kinds of debt always are either. I may never have to pay rent, but I’ll always have to pay property taxes. There’s always some kind of trade-off, I guess. I do think mortgages are the normal, but that’s because housing values are so high. There’s no way I could have bought a reasonable house in the area I live in for a year’s total income, much less take home pay. My view is this: Housing prices are subject to the same forces as tuition. It’s not too hard to get loans, so the prices on both items have gone up to capture the available money. That makes it difficult to buy in to housing or college without taking on some debt. Unless the loans dry up (which would hurt a ton of people short-term), the prices won’t drop to prices that most people can manage without taking on debt. That’s precisely why we’re trying to get out of our mortgage debt! When we bought our house, my dad called and said “congrats on being in debt for 30 years if you don’t pay it off sooner.” Good ole’ dad. There to keep things in perspective. But we wanted to get out of that debt as soon as we got into it! In our book, this debt is still debt! I agree with you! Preach it sista’! Yes, debt is debt. The idea of calling something “good” debt makes it too easy to accept, IMHO. I think long term debt is bad….but mortgage debt could be good if you are getting a ridiculously good deal, know you can pay it off quick, and have a back up plan if things go bad. We bought out 1st house in 2001 for at least $100k less than it was valued (probably more than that). We paid it off quick. When the economy tanked we bought our 2nd home for $200k less than it’s value. We can sell our first home for more than double what we paid. The debt we had for the 1-2 years was worth it. No doubt that owning a home can be a fantastic investment. Our mortgage was over $200k; we were approved for $400k. I find it hard to believe that most 26-year-olds could unbury themselves from something like that very quickly. Yet, almost everyone just accepts it and signs anyway. We do have a mortgage of 350k…..but it is temporary! I’d hate to pay a mortgage for 30 years. So I guess what I’m always curious about in terms of the mortgage = debt concept is: you do have the option to sell the house, recoup a large chunk of the costs, and go from there, right? (Whereas, for example, with my student debt I can’t sell my education to someone else and recoup the costs per se.) I’d be interested to know if this is something you guys have considered. Like I know J. Money regrets buying a house, and now he’s decided to sell it. I really know nothing about buying houses, by the way, never having been in a situation where a real estate agent would do anything other than laugh me out of their office (due to my student loan situation and relatively tiny income). But it’s interesting to hear different perspectives on what it means and whether it’s worth it. Oh, sure. We could definitely sell but have no intention of doing so. We love our home, and we got in the market at exactly the right time. We’ve owned the home for three years and estimates show it selling for over $50k more than what we paid not factoring in the renovations. I don’t regret buying it – I just don’t know that I really think of any debt as “good” debt. You could make the argument that depending on your field, you are trading your loans for a well-paying job. At least, that’s the theory, right? I know it’s pretty bogus in this economy, but theoretically you should get some capital out of getting an education. Right. Onward and upward 🙂 I love reading about your journey on the Yachtless. So glad I found your site! My fiancé & I do not have a mortgage yet, we are still currently renting. We jumped into almost buying (since rates have been so low), but made the conscious decision to bulk up our down payment & build up an emergency fund (for additional housing expenses, more than likely) before making the leap into home ownership. We also are trying to avoid PMI if we can! This isn’t to say we do not want to own a home & take on a mortgage (we really do! ), we just are taking our time before making the leap. Renting has given us a bit more freedom, but we do understand that all of our payments are not building into equity of a place we fully own. It’s a challenging debate, especially for our generation! I do view home ownership as one of the only assets that will potentially appreciate in value – which is a huge plus, considering most investments depreciate over time. It makes my head spin because there are many complexities to real estate vs. renting. It may never feel like it is the right time to take on a mortgage – but our plan for the future is to definitely pay it off faster than the length whether its 15 year, or 30 year. We love our house. The mortgage is affordable, the yard is huge for all of my gardening shenanigans, and we’re right next to miles and miles of forest preserve, a small fishing lake, and a horse farm. I’ve asked for a pony every year we’ve lived here. 😉 Home ownership IS great. But it’s also a serious commitment to debt – fast payoff or not. One of the most frustrating things about our debt is the fact that we were never really that irresponsible when it came to spending. Like you, we followed the standard path and made “normal” purchases. However, I think you have more options when it comes to mortgage debt. You can (almost) always sell and walk away – which can’t be said of the credit cards or student loans. Or, you can continue to pay and build up equity in your property – after the payments are done, you will own something. It’s not the same as having a zero balance on other types of debt. Either way, recognizing that you have options beyond the standard American life is an important step in the right direction. Your insights are so keen. Recognizing there are lots of options is really important. We also fell for the “American Dream.” To make matters worse, we are a military family whose mortgaged house is now a rental property. We started digging ourselves out of debt nearly 4 years ago… and now with $22K left on our mortgage, it should be GONE in the next 9 months! Can’t wait and so happy that our hard work is paying off. “When you find yourself lost in the woods, you don’t traipse through the underbrush; you pick the path.” AHHHH – I LOVE that line. I am firmly in the “a house isn’t for me” for now camp, but I suppose if that changed, I wouldn’t have a big problem with taking on a mortgage. I do think I’d prioritize paying it down early though. “Reframing it as debt helped me realize that I should be hustling to get rid of it, not just accepting the payments as part of life.” I think this is the essence of it. I have a mortgage on my current home (as I’ve had mortgages on past homes). It doesn’t make me feel icky…paying it off so slowly and watching my home value sink slightly is what makes me feel icky! While I can’t do a lot about the home value, I’ve been adding extra principal payments on the mortgage each month. However, other goals have caused my progress to be slower than I’d like. The question is what are your alternatives? First of all, do you want to be a homeowner, or do you want the freedom of being a renter? If you don’t want to be a homeowner, if you let “everyone” talk you into buying something that you’d really rather rent, then your debt is bad debt. If you want to own the home, to know you won’t be sent packing a the end of the lease; f you want to paint the walls your color, renovate to your hearts’ content (or not) and to know this is your home until you don’t want it anymore, then you again have to look at the alternatives. You could have rented a place that cost about as much as your house payment; would it have been as nice? However, to eventually get a house, you’ll need to save money on top of the rent. Is it possible to save up enough money to pay cash for a house? I suppose, but you’ll spend a lot on rent in the meantime. Once you have the house, and the debt the question is whether you agressively work to pay down the debt or whether you use that money elsewhere. We chose a combination. We bought our first house about twenty years before we paid off this one. It is nice not to write that mortgage check every month, though compared to our current income, it wasn’t very high (about 1/3 of what it would cost us to rent a comparable house). However, we also invested in the stock market along the way. We could have paid the house off sooner, but we would have lost the growth in our other investments and those investments are there for long-term goals too. The big difference between a mortgage on a house and a credit card bill for shoes is that the house is an appreciating saleable asset; the shoes are an expense. I’m not going to tell you to think of the tax benefits. I’m also not going to tell you to think of it as an investment because you never know where the housing market will go. A mortgage is debt. The way I think of it, you have to live somewhere and you will have to pay no matter where you live. I choose to pay a mortgage. There were times where I wanted more flexibility and chose to pay rent. great post. Sometimes we all like to trick ourselves about our debt by changing our perspective on it, but in the end it is still just debt. Ironically, my family suggesting I start looking to buy property is what really woke me up to my finances, the credit card debt (now gone), and just how much I really owed in student loans. I’m not buying real estate anytime soon thanks the the six figure student loan debt I carry around. I’m totally in the “mortgages make me feel icky” camp. Mostly the interest payments over the lifetime of the loan give me goosebumps! Luckily we live in a very reasonable COL area. We’re putting a 40% down payment on a house next month, and we’ll have our loan paid off in a year and a half! For me, I think the biggest difference in how I think of debt is the interest rate. We financed our mattress ($5,000) at 0% interest for five years. I don’t even think of that debt. I just make the payment every month, knowing it’s the same as paying cash (except I’m earning interest on money in savings that would’ve been spent on the mattress had I actually paid cash). But anytime I’ve had debt that cost more money than the purchase price, I’ve had to pay it off as quickly as possible. It makes me feel anxious otherwise. You’re totally right that people categorize mortgage debt as good no matter what and other types of debt as frivolous. My dad tried to convince me to buy a house when it made absolutely no sense to do so. (I had student loan debt and was still a college student making very little money.) But people would’ve looked at me with a mortgage at 21 and thought I was responsible and successful. I hate my mortgage, and I’ve been underwater on my home/loan for the better part of the last 10 years. But I’m slowly coming around to the thinking that it’s a low-interest loan that frees up a significant chunk of money for me to invest in my retirement goals. 4% interest and “affordable” payments gives me more than $1,500 per month that typically gets socked away into one of my various accounts, where I can expect to earn a higher return. Still hate the mortgage, but it is cool too see the balance come down these past 10.5 years. I’m finally at the place where I’m paying more principal than interest.